Last night Michael and I saw "The Donny & Marie Show" at the Flamingo Showroom in Las Vegas as guests of the new director, Richard Jay-Alexander. It's no surprise to anyone in Vegas that the show has been a huge hit since the talented two-some opened their show here. Last night was the first chance Michael and I have had to see the show and it's really terrific. The showroom is the best showroom in Las Vegas. Beautiful red velvet walls and leather booths - old school Vegas but not old or rundown. Beautiful. And the show - well, it completely showcases what Donny and Marie do best. In addition to highlighting the ongoing "sibling rivalry" - now focused on Donny's win on 'Dancing With The Stars' versus Marie's third place showing - we get to hear these two show business veterans SING. They've always had great voices and this show makes it clear that some things, like fine wine, continue to get better with age. After opening the show with several duets, including one from their new CD - Donny and Marie, each takes a solo turn in the spotlight. Marie ends a Kander & Ebb medley by belting an impressive "World Goes Round," then switches it up to full on gorgeous soprano with "Somewhere" from West Side Story. I've been a fan of Donny since I was five. He inspired me to become a performer. Donny's voice is as strong, clear and exciting as ever and he delivers hit upon hit; whether it's "Go Away Little Girl" and "Puppy Love" or Osmond classic "Crazy Horses" or a full on replication of the athletic Osmond choreography to "Yo-Yo" from the early 70s. Now in his early 50s, Donny doesn't merely keep up - but he sets the bar for the ensemble dancers on stage with him. On top of that, both have an natural affinity for interacting with the audience that makes for a show all unto itself. Only through the years that they've put in performing live could result in the ease and charm that they both bring to the stage. The show is extremely well paced, and the lighting is gorgeous. There's a reason why the show was completely packed. There's always an audience for talent. Sorry, make that Talent. 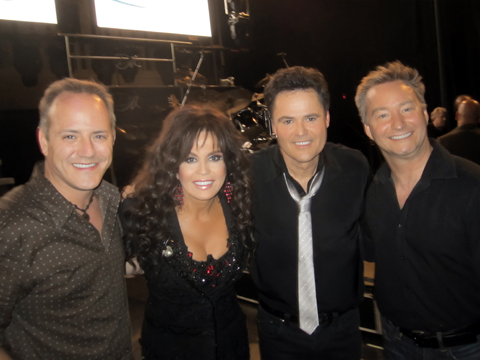 Donny & Marie know exactly what they do well, and it's onstage at the Flamingo. They sing, they dance, they're funny. About the only things they don't do is perform with fire baton or on toe taps. But you get the sense that if you asked, Donny might just say "give me a minute..."
If you're in Vegas make sure you go see them. You get your money's worth and more. Alan and I actually had tickets to see them there last year, but it was only a short week after Marie's son's death. The night for which had tickets was supposed to be their first show back, but when we arrived at the theater that night we were told it was cancelled. It sounds like a terrific show, you make me want to try to get back there! Nice review, Randy!